Bartenders are responsible for mixing and serving drinks for customers. They typically work at bars, restaurants, or other licensed establishments. Bartenders in the United States typically depend on tips for much of their income. 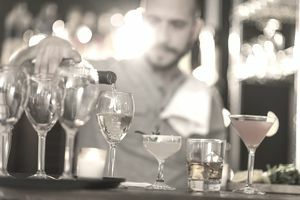 Below is a list of the top five most important skills for a bartender, as well as a longer list of other skills employers, seek in candidates for bartender jobs. You can use these skills lists throughout your job search process. Firstly, you can use these skill words in your resume. In the description of your work history, you might want to use some of these keywords. Finally, you can use these skill words in your interview. Make sure you have at least one example of a time you demonstrated each of the top five skills listed below. Bartenders need to have good short-term and long-term memory. Short-term memory is very important for remembering and keeping track of each customer’s order. Long-term memory helps you remember the names of regular customers and even their favorite drinks. Customers appreciate a bartender who listens and remembers their orders. As well, your long-term memory will help you remember the beers available on tap and in the bottle and the recipes for complicated mixed drinks. Communication is critical for a bartender. You have to speak with customers throughout your shift, so make sure you speak loudly and clearly and maintain a positive tone. Perhaps most importantly, being a good communicator means being a good listener. You need to listen carefully to your customers’ orders. Often, bartenders will chat a bit with customers to create a friendly atmosphere. Make sure you are actually listening to what each customer says – that is what makes a good bartender great. Bartenders are often busy running all over the bar and serving multiple customers. A good bartender keeps close track of who ordered what, who paid, and who is still waiting for a drink. Being organized allows a bartender to juggle these multiple tasks. Bartenders should also keep the bar clean and organized – this not only looks better to the customer but also allows the bartender to work more efficiently. As well, bartenders need to ensure that the bar is stocked and restock items (like bottles of alcohol, ice, fruit for garnish, etc.) as they run low. A good bartender greets every customer with a hello and a smile, even if he or she cannot serve the customer right away. Being kind, even towards frustrated customers, is important. A good bartender is also skilled at reading people. Sizing customers up, and knowing if they want to make conversation or simply order a beverage, is a valuable skill for bartenders. Being a bartender can be very stressful. Sometimes, you are serving dozens of customers at once. A good bartender maintains all the previous qualities – memory, communication, organization, and friendliness – even under pressure.